Cherry wood comes from Black Cherry trees which usually grow throughout North America, although is also prevalent in Europe, Central America, and South America. Cultivation of both the wood and the fruits of the tree occurred in Central and South America long before European contact. Now, it can be cultivated wherever it is grown. Cherry wood is also traded and used throughout the world. Cherry is classified as a premium hardwood plywood. It is thick in density, very hard, and durable. These features also tend to make it a bit pricier. While the name “Cherry” refers to its tree of origin, the color definitely reflects the name. Heartwood of cherry wood is usually of a deep reddish brown color, while the sapwood is usually a light pinkish color. Heartwood is the denser, inner part of the tree trunk which is harder. Sapwood, on the contrary, is the softer, outer layers between the heartwood and the bark. Typically, cherry wood components are made of approximately 25% sapwood and 75% heartwood. 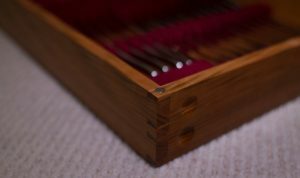 Furthermore, cherry wood is workable and easily sands down to what many would call a “glass-like” smoothness. This also means that cherry wood finishes nicely and looks beautiful. Wood finish refers to the process by which the plywood’s surface is refined and protected. This is especially essential when it comes to use in furniture, which will be discussed further down. 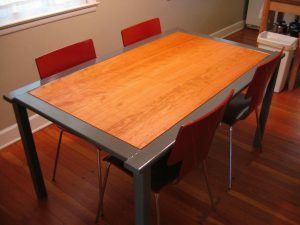 Again, cherry hardwood plywood is intended to be used for projects which require stronger woods. Although they can be used in pretty much any project, it is not advised where it is not necessary due to pricing. Many people only use this, again, in projects where they must have a strong and durable plywood. Hardwood plywood can be used in any number of construction projects. For instance, many people like to use cherry plywood to make furniture, such as cabinets, since it is both durable and looks good. Cherry plywood is also great in use for flooring or wall panels, although it is less commonly used with the latter. Cherry plywood flooring is common, due to the fact that it holds up so well against any type of damage. Other uses of cherry plywood include various musical instruments, other architectural designs (ex. decorative wall panels, doors, and other fixtures), packaging or boxes (especially those which are used for tool storage), and toys or playground equipment. It can also be used to make various types of sports equipment, such as lacrosse sticks, although this is less common. Because of cherry wood’s strength and look, it can be used in a variety of projects. Although, again, use of it is not recommended where it is not necessary because of its higher price. A type of cherry plywood, commonly named Brazilian Cherry is actually not made from cherry tree. This hardwood is made of Jatoba tree, it is suitable for floorings and known as damage-prone wood. Again, black cherry trees are grown and harvested throughout the world, which means that cherry plywood is equally available. Purchasing directly from the producers or manufacturers is always an option. Or, if a person does not want to do that for one reason or another, in store purchases of cherry plywood are usually available at any local hardware store.